Make sure that the link box is plugged into the same graphic card with the monitor or TV. The onboard cards, which are connected to PC’s motherboard, are usually not powerful enough to support the Vive. Make sure the link box is used in a correct direction. The orange cables from the headset should be plugged into the orange ports on the link box. Make sure all cables are connected firmly, especially the HDMI cables. Unplug and plug back all the cables might help. Update the video drivers to the latest version. Make sure that headset, controllers and base stations are all up to date. Uninstall and install Steam and SteamVR if needed. Try the USB 2.0 port instead of USB 3.0. This is a really inadequate description of an inadeqaute error message: you're customers are not that stupid. They know they need current drivers and connect the cables in the right way. When eveything else works but the Vive won't connect, it is the Vive and its drivers. Please, please provide more possible solutions, many more. I'm using a GTX1070 and I guess the issue with this card is different from people using an AMD. As of June 16th of this year, SteamVR beta updated 1497655233 has addressed this issue. Previously, 208 error was reported when it should have been a 108 error. Valve has corrected this in the above release. SOLVED. I have had this error many times and have tried re installing etc etc. The fix that works for me is to make sure the vive mains power plug is unplugged BEFORE you turn on your pc. Then plug in the mains power plug, you will hear the computer make an audible noise confirming device detected and it always works.....no more headaches. Pls copy this to the various forums if it works for you. I have changed to beta and still persist error 208. Thinking in returning the headseat. Blackdog, did you try my fix above? I have been struggling with the 208 error for weeks now and nothing was working, I had tried every single troubleshooting solution out there. Today, I popped off the cover on the headset itself and saw where the cords connect to it and just to check I was pushing on the HDMI and I felt it go in all the way like it was only half plugged in. I can only guess that over time the motion of the cords in the headset can jiggle the connections loose. Once I restarted my computer the headset worked. I don't know if this is your problem but it's worth taking a look at, best of luck! Always check cables first when you're getting 108 or 208 cables! Reseating is quick and often solves the problems right away. Hey everyone! I literally just made an account to post my fix for this so here goes. Until I stumbled across a video of how to replace the vive headstap and found that there are cables you can remove at on the HMD itself. I soon noticed that once I had taken off the cover plate that holds the cables in, the HDMI cable was loose. After pushing the hdmi cable firmly into the HMD and placing the cover back on, a quick reinstall of SteamVR and reset of the headset made it detect! Hell yeah! Available now. 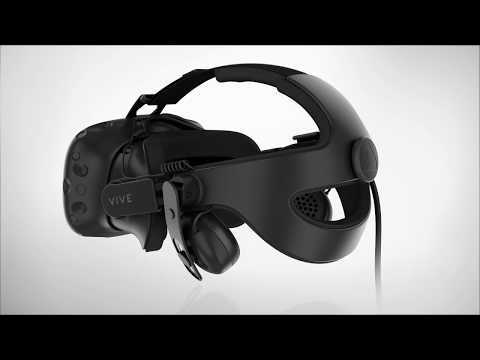 Learn how to replace the current strap of the VIVE headset with the VIVE Deluxe Audio Strap. Whether you have the old or new 3-in-1 cable, you can secure it to the clip on the side of the VIVE Deluxe Audio Strap.